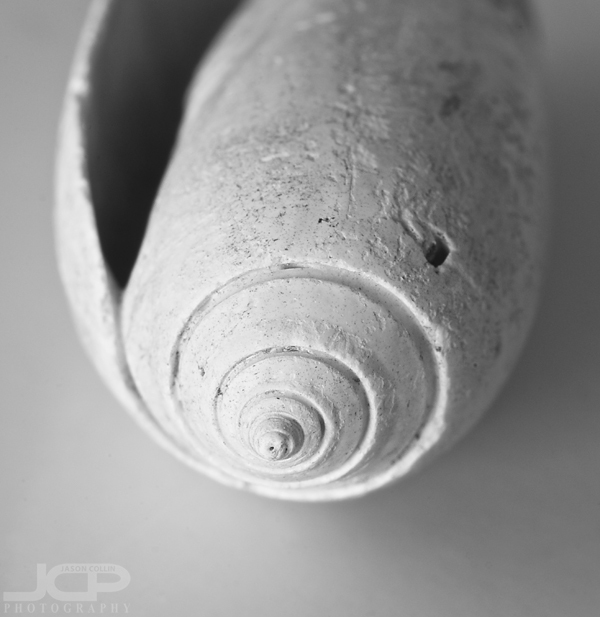 Nature's spiral black & white seashell macro image - Nikon D300 Nikkor 105mm VR micro @ f/32 ISO 200 2.5s tripod mounted with cable release Strobist: Nikon SB-800 Speedlight @ 1/4 power in 42" brolly to frame left using Yongnuo radio triggersPhotography is mostly about observing. To be a good observer, I believe one needs to practice silence in mind and body. The seashells featured in this photo story would not found along a quiet beach where I was taking a contemplative stroll. They were, in fact, found in the middle of the chaos of my neighborhood dog park, but since my mind was silent, I was able to observe them. 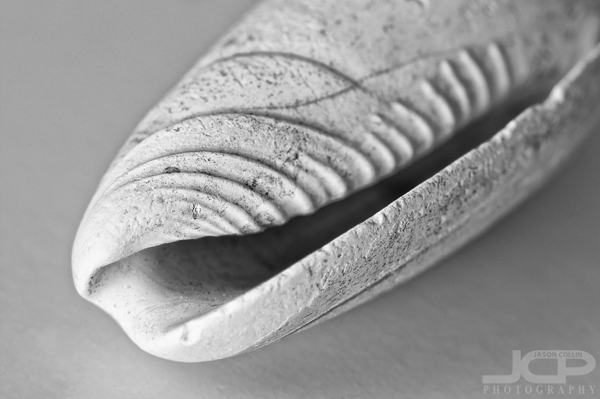 This seashell reminds me of an anklyosaurus - Nikon D300 Nikkor 105mm VR micro @ f/22 ISO 200 1.6 sec tripod mounted with cable release Strobist: Nikon SB-800 Speedlight @ 1/4 power in 42" brolly to frame left using Yongnuo radio triggersBy the newly installed water station there is a ring of seashells, not crushed, but small and mostly whole. As I pushed the nozzle to let Kiki drink, I observed this unusual fact. Mostly one finds crushed seashells used in landscaping purposes so to see a bed of intact seashells surprised me. You have to bend over quite a bit to trigger the water flow allowing me to notice the details in the shells. 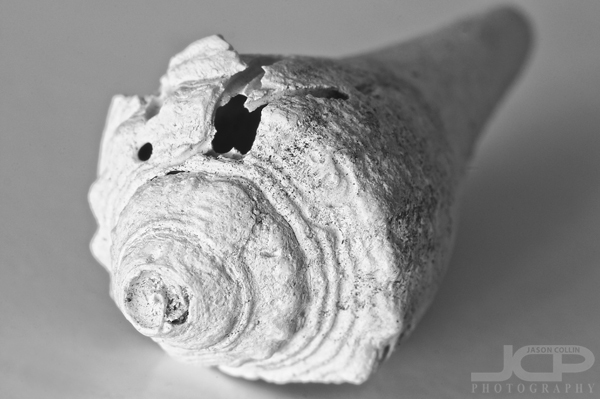 I thought to myself, "I will take a few home to make macro photographs of." Into a cavern of a seashell opening - Nikon D300 Nikkor 105mm VR micro @ f/22 ISO 200 1.6 sec tripod mounted with cable release Strobist: Nikon SB-800 Speedlight @ 1/4 power in 42" brolly to frame left using Yongnuo radio triggersIt fascinates me to think that such objects once resided untold miles away at untold depths in the sea. Where were they from? How old are they? Of all places they end up in a dog park, albeit one very close to the sea. In fact, you can see a part of Tampa Bay from the park. Now these seashells have journeyed a few more miles to inside my apartment. They have felt air conditioning. However, I shall return them shortly to the dog park and their water fountain resting place.